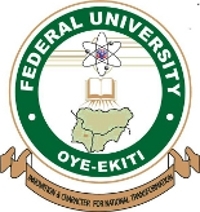 Federal University Oye-Ekiti, [FUOYE] Pre-Degree Programme Admission Form, Eligibility, Duration, Subjects Combination, Application Guidelines, Entrance Examination Date, Time and Venue for 2018/2019 Academic Session. Applications are hereby invited from suitably qualified candidates for admission into the Federal University Oye-Ekiti, Pre-Degree Programme for the 2018/2019 Academic Session. ii. The date for the Final Entrance Examination is 31st January, 2019 at Iyke Ifeanacho ICT Centre, behind UBA Bank, Oye-Ekiti by 9:00a.m. Prompt. i. Candidates are expected to note that the date for the Final Entrance Examination is 31st January, 2019 at Iyke Ifeanacho ICT Centre, behind UBA Bank, Oye-Ekiti by 9:00a.m. Prompt. iv. The date for the Final Entrance Examination is 31st January, 2019 at Iyke Ifeanacho ICT Centre, behind UBA Bank, Oye-Ekiti by 9:00a.m. Prompt.